Pizza Pizza Royalty Corp. (“PPRC”) trades on the TSX under the symbol “PZA”. On 01/01/2013 PPRC, formerly Pizza Pizza Royalty Income Fund, began trading. As it applies to PPRC and Partnership, it means January 1 to December 31. As it applies to PPL, it means a 52-week reporting period ending on the Sunday closest to December 31. Every five or six years PPL´s fiscal year includes an extra (or 53rd) week. Beginning January 1, 2011, with the adoption of IFRS, the PPL consolidated statement will no longer include the Partnership. The Partnership is consolidated with PPRC. From the year ended January 1, 2006, PPL and the Partnership were consolidated quarterly and had co-terminus quarter end and year end dates with the Fund. 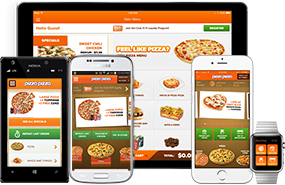 The increase in gross sales generated from Pizza Pizza and Pizza 73 restaurants in Canada that have been open 12 months. In any period, those Pizza Pizza restaurants on which a royalty equating to 6% of their System Sales is to be paid to the Partnership and those Pizza 73 restaurants on which a royalty equating to 9% of their System Sales is paid to the Partnership. The QSR segment of the Canadian commercial foodservice industry usually contains establishments having counter service and emphasizes take-out and delivery. The Fund used the proceeds of the initial public offering to indirectly acquire, through the Partnership, the trademarks, trade names, operating procedures and systems and other intellectual property and proprietary rights and all goodwill associated therewith owned by PPL and used in connection with the operation of all restaurants operated by Pizza Pizza, its subsidiaries and its franchisees (collectively, the “PPL Rights”). The Fund used the proceeds of the private placement to indirectly acquire, through the Partnership, the trademarks and other intellectual property and proprietary rights and all goodwill associated there with owned by Pizza 73 and it’s affiliates.